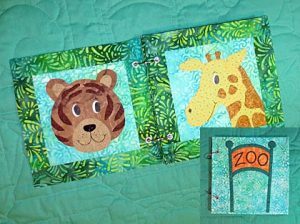 A couple of years ago at Quilt Festival in Houston, a fellow exhibitor was looking at our Zany Zoo Faces and remarked that the pattern could be used to make a Quiet Book as a companion to the wall quilt. What a great idea! Quiet Books use the same blocks found in the patterns. Flannel is used in place of batting. No quilting is needed. The book is held together with metal eyelets and binder rings or machine-stitched eyelets and ribbon /cord. 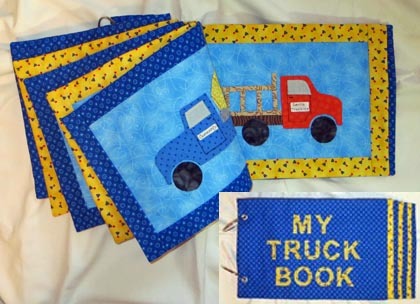 Embellish the pages with the name of the animal or truck. Write or embroider the child’s name on the cover(s). We have three patterns that can be used for Quiet Books and two more are in the works. 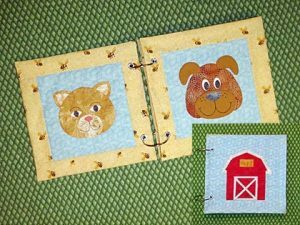 If you purchase Zany Zoo Faces, Farm Fresh Faces or Just Trucks Quilt from us at a show, we will give you a copy of the instructions to make your own book. The instruction sheets are also available on our website. Click on Bonus Extras at the top of the page. Look for the particular pattern and print the instruction sheet. It’s that simple!